Sambo Dasuki was the immediate former National Security Adviser, NSA, in the Goodluck Jonathan's defunct administration. Just few days after he was removed from the office by the newly elected President Muhammed Buhari, reports from Nigeria revealed that he was arrested by security agents under suspicion of planning a treasonable felony. Security agents searched his house in Abuja and his father's house in Sokoto. According to reports, certain military equipment that included bullet proof cars were found in his Abuja residence, but his father said that nothing incrimination was found in his own Sokoto residence. Dasuki is not alone. Gordon Obuah, former chief security officer, CSO, to the same former President Jonathan, has been in police custody for more than a week, and without a charge or explanation by security agents why he has been put behind bars. Obuah's problem reportedly began seven days before government security agents decided to put him behind bars. 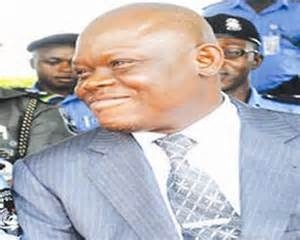 Having been asked to report daily to the office of the State Security Service, SSS, Obuah resumed duties with the officers on reporting in the morning and was never allowed home until 2300hrs on each of the seven days he reported at the SSS office, before his detention order without any explanation of the offense he may have committed. There have been rumors of Obuah's death in custody, but another news monitored in one of the Nigerian newspaper said Obuah said he is alive. The irony scenario in all these developments, observers noted, is that President Buhari in Washington talking about Justice, Justice and Justice everywhere he has spoken, including an interview with CNN's Christian Amanpour, but at home, acts of injustice are perpetrated, while the president is looking the other way and saying different things equating injustice to justice. In Nigeria, injustice has always been equals to justice. It is in Nigeria that a man won a presidential election, ended up in the bowel of government's custody and became a dead man. It was in Nigeria that a journalist was served a bomb in his home and was sent to premature death, and no government could get to the root of the assassination and the family for being incapable to fight for justice, everyone continued life as if no evil was perpetrated and it was in Nigeria no government ever paid attention to the children's future. In Nigeria, It is justice for unlike minded people to come together all in the bid to wrest power for the sake of power with a song about change. And now, people have begun to ask what change has taken place in Nigeria other than some set of politicians seizing power and begin their program to stifle dissent in the name of fighting corruption. Nigeria's injustice for justice began way back in the first Reupublic, when a journalist, Minere Amakiri's head was shaved at the delight of a state governor, for being critical of the governor at a time the governor wanted to be applauded. Dele Giwa was detained thrice during Alhaji Shehu Shagari's government on phone excuses of undermining the government for doing nothing but publishing the truth. It was the same development that prompted Ray Ekpu's writing during his Concord Press days about Kangaroo courts, where injustice is dispensed as justice. He was taken to Alagbon where he spent a weekend for his audacity. Calling injustice justice is the characteristic of the Nigerian system. 32 years ago, Buhari put the media and everyone he could lay his hands under the battle. With Dasuki and and Obuah's experience, it shows Buhari has not changed. He is the same person that he was 32'years ago, ready to deny people their freedom with excuse of fighting corruption. Let the Nigerian media take note and be ready for another experience similar to that it had 32 years ago, when Tunde Thompson and Nduka Irabor, the duo of Guardian journalists who were jailed under Decree 4 - enacted specifically against the media by Buhari's military government.